On Friday, May 6, getTV is proud to present the network premiere of the newly-restored 1937 Columbia Pictures musical When You're In Love! It stars beloved leading man Cary Grant and Golden Age songstress Grace Moore. The film is helmed by Oscar-winning Frank Capra collaborator Robert Riskin in his directorial debut. It also boasts breezy song-and-dance numbers highlighted by standards written by legendary composer Jerome Kern and lyricist Dorothy Fields. 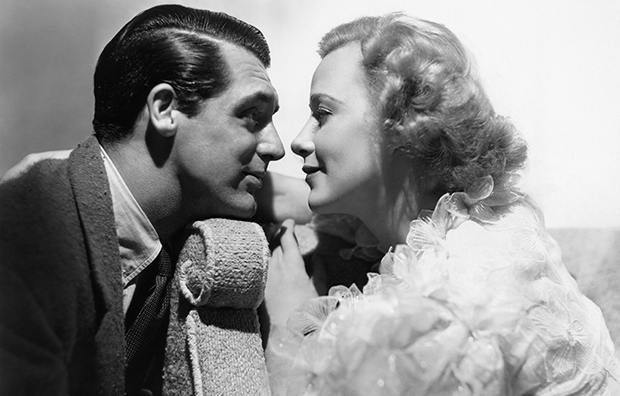 When You're In Love stands out as one of Cary Grant’s earliest comedic roles. He plays Jimmy Hudson, a poor artist who can’t leave Mexico until he can pay his hotel bill. Caught in a similar situation is Australian opera singer Louise (Moore) who was deported to Mexico after her American work visa expired. Desperate to re-enter the U.S., Louise’s manager offers Jimmy $2,000 to marry her and seemingly solves both of their problems at once. However, things begin to get complicated when feelings of true love begin to blossom between the bickering pair. Before the debut of this restored classic on getTV, we wanted to hear the backstory of its extraordinary restoration. We sat down with the talented Rita Belda, who is VP of Asset Management, Film Restoration, and Digital Mastering at Sony Pictures Entertainment. It is her team's mission to help preserve the history of the Sony Pictures' library (from Columbia Pictures) and make the films available to audiences today. Some of her own favorite restoration projects have included It Happened One Night, Lost Horizon, and Crime And Punishment. Let’s start from the beginning, Rita. How is a movie selected by your team for restoration? Films are selected based on the need to preserve them. All films from the early part of the last century are particularly at risk, because they are on nitrate film stock and, as many film buffs know, nitrate is flammable and subject to deterioration which can result in complete disintegration of the film over time. Films are selected by priority and condition in most cases. Why did you choose When You're In Love? When You’re In Love was scheduled as a preservation project as part of our on-going work to address all titles in the library. It started as photo-chemical restoration in 2005, and was limited by the severe damage in the original negative, which could not be fully addressed until digital restoration tools were available. We began working on the digital restoration in 2014. What is it about this film that’s special and that classic film fans will love to see? Certainly Cary Grant being the leading man is one. The film has not been widely available. Prints have not been circulated in recent years and it has never been on DVD, so most audiences will not ever have had a chance to see the film. It’s a superb example of the screwball comedy and directed by Robert Riskin, who is best known as Frank Capra’s partner in scripting classics like It Happened One Night and Lost Horizon. It’s a charming screwball comedy that touches on all the features of the genre. What are some of the challenges you faced with restoring this film? The original negative was in very poor condition in some areas due to wear and handling in the days of its release. The negative was missing perforations through a large section of one reel, so we couldn’t originally run it thru a printer in 2005. Digital scanning provides more gentle ways of handling the film, so we were able to use the entire reel despite the damage. With digital tools, we were able to replace frames that were cut from the film more seamlessly than would have been possible with only photochemical tools. Many reels of the negative had frames lost due to damage or editing and we were able replace these frames from a nitrate print from the 1930s. For example, when the film was re-released, the original opening sequence, which features a close-up of Grace Moore singing an aria by Puccini, was cut down a bit and possibly even edited to attempt to correct Ms. Moore’s lip sync with the audio. We were able to replace the sections eliminated from her original performance, which the original audiences would have seen. Did you work with any other entities/archives on this restoration? Yes, the Original Negative and soundtrack are stored at the Library of Congress, who played a major role in preserving these materials until we were able to take on this restoration. The Nitrate Print was borrowed from the UCLA Film and Television Archive, and their collaboration was critical to restoring all of the material in the film. We also worked with several vendor-partners on the work: Deluxe Audio, Colorworks / Deluxe, and Prasad. What should classic film fans look for in this film – were there any highlights or surprises for you when you watched the restoration for the first time? Finally, why is film restoration so important? Films from yesterday and today are a reflection of our culture, and important documents of our history. While the entertainment industry produces new films every year, the legacy of our shared past can be glimpsed and revisited through preservation of films. Moving images capture more of that legacy, in picture, sound, and motion than any other document can. Particularly in the Golden age of Hollywood, films were mass-market entertainment forms representing significant collaboration of artists and craftspeople on a shared vision. As a result, they tell us much about what was important, entertaining, and engaging to previous generations. Restoration can capture and retain the vision of the original artists, and reflect that back to the audience. Thank you so much for your time, Rita. This has been fascinating and we're more excited than ever to see When You're In Love!